بخشنده امنیه, حسن, مسعودی, مجید. (1395). ارزیابی و تحلیل ارتباط نتایج آزمون فشار آب و خورند دوغاب سیمانی در عملیات تزریق سد سیمره. نشریه انجمن زمین شناسی مهندسی ایران, 9(شماره 1 و 2), 69-84. حسن بخشنده امنیه; مجید مسعودی. "ارزیابی و تحلیل ارتباط نتایج آزمون فشار آب و خورند دوغاب سیمانی در عملیات تزریق سد سیمره". نشریه انجمن زمین شناسی مهندسی ایران, 9, شماره 1 و 2, 1395, 69-84. بخشنده امنیه, حسن, مسعودی, مجید. (1395). 'ارزیابی و تحلیل ارتباط نتایج آزمون فشار آب و خورند دوغاب سیمانی در عملیات تزریق سد سیمره', نشریه انجمن زمین شناسی مهندسی ایران, 9(شماره 1 و 2), pp. 69-84. بخشنده امنیه, حسن, مسعودی, مجید. ارزیابی و تحلیل ارتباط نتایج آزمون فشار آب و خورند دوغاب سیمانی در عملیات تزریق سد سیمره. نشریه انجمن زمین شناسی مهندسی ایران, 1395; 9(شماره 1 و 2): 69-84. یکی از ویژگی‌هایی که در بررسی­ ژئوتکنیکی توده‌سنگ‌ها ارزیابی می‌گردد، نفوذپذیری است که از آزمون فشار آب و عدد لوژن تعیین می‌گردد و از آن در تعیین تزریق‌پذیری ساختگاه سد و تونل و پیش‌بینی مقدار خورند استفاده می‌گردد. در این تحقیق، با استفاده از اطلاعات سد سیمره، ارتباط بین عدد لوژن و خورند تحلیل گردید و تاثیر وضعیت کیفی توده‌سنگ و عمق مقطع، بر این رابطه مطالعه گردید. نتایج نشان­ داد بر اساس مقادیر RQD، در گروه سنگ‌های با کیفیت بسیار خوب با ضریب همبستگی 82/0 بیشترین ارتباط بین لوژن و خورند وجود دارد و براساس عمق نیز، در مقاطع بسیار عمیق با ضریب 85/0، بالاترین همبستگی دیده می‌شود. علت همبستگی بالا در سنگ‌های با کیفیت مطلوب و در اعماق زیاد که تعداد درزه‌ها و میزان بازشدگی محدود است، مسیرهای مشخص نفوذ سیال است. در نتیجه نفوذپذیری با روندی یکنواخت برای آب و دوغاب همراه است. در سنگ‌های ضعیف با وجود احتمالی پرشدگی‌های رسی، شکستگی­ و بازشدگی‌های مختلفی دیده می‌شود که باعث نفوذ متفاوت آب نسبت به دوغاب می‌شود. لذا در سنگ‌های با کیفیت بسیارخوب یا در اعماق زیاد، آزمون فشار آب می‌تواند در پیش‌بینی میزان تزریق‌پذیری استفاده گردد. One of the properties that evaluate in geotechnical reviews at rock mass, is the amount of permeability, that determine from water pressure test (WPT) and lugeon number. From the results of these test, use in determining of the amount of groutability in tunnel and dam site. Logical and practical relationship between amount of water penetration in Sections and cement grout take, leads to find prediction model of take amount in sections and so, necessity and the amount of grouting defined and will Cause to optimization of grouting operation in terms of technical and economic. In this study, using the Seymareh dam site data, relationship between lugeon number and grout take analysed. Then the effect of rock mass quality and depth of the grouting section to this relationship were studied. The results showed that in surface and much deep sections, penetration of water and grout, with correlation coefficients 0/86 and 0/82 have more relationship than central and deep sections, with coefficients 0/62 and 0/58. also in terms of quality of rock mass (according to RQD coefficient), in sections with very good and poor quality, these two parameters with correlation coefficients, respectively, 0/82 and 0/75, are closer together than good and medium sections with the coefficients 0/54 and 0/58. In central sections with state average quality, because of existence karst cavities and filling of joints and happening of hydraulic fracture, this correlation reduce. شرکت مهندسی مشاور استراتوس، گزارش مطالعات زمین‌شناسی مهندسی و نتایج تزریق در سایت سیمره، 1385. Nonveiller, E., 2007. Grouting Theory and Practice: Elsevier, Amsterdam. Ewert, F.K., 1998. Rock Grouting with Emphasis on Dam Sites: Springer, Verlage, Berlin. Widmann, R., 2004. International Society for Rock Mechanics-Commission on rock grouting. International Journal of Rock Mechanics and Mining Science and Geomechanics Abstract, 33(8): 803-847. Houlsby, A.C.,1999. Engineering of grouting curtains to standars. 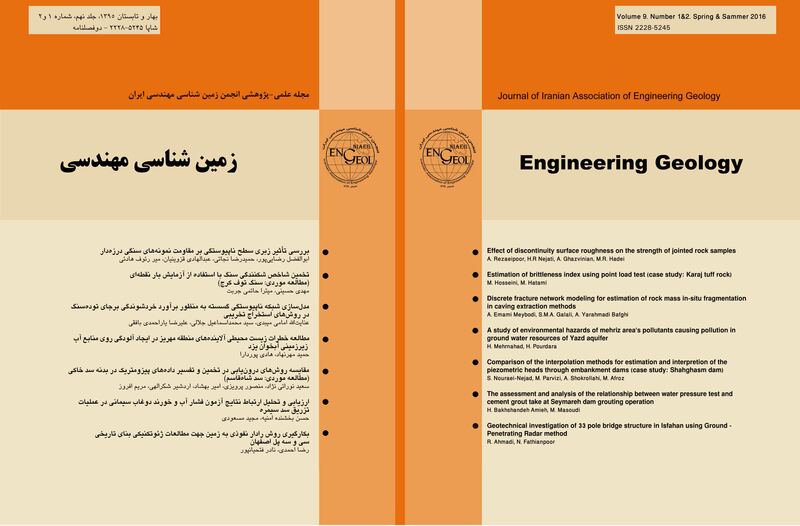 Journal of Geotechnical Engineering Division, ASCE, GT9: 953-970. James Warner, P.E., 2004. Practical Handbook of Grouting Soil, Rock, and Structures. John Wiley & Sons, Inc., Hoboken, New Jersy. Houlsby, A.C., 1990. Construction and Design of Cement Groceting. John Willy & sons. Shroff, V., Shal, L., 2002. Grouting Technology in Tunnelling and Dam Construction: A.A. Balkema, Rotterdam. Joseph, P., Welsh, P.E., George, K., Burke, P.E., 2000. Adnances in Grouting Technology. Geotechnical Engineering Conference, Australia. Dalmalm, T., 2010. Choice of Grouting Methods for Injected Hard Rock Based on Sealing Time Prediction: Division of Soil and Rock Mechanics Department of Civil and Architectural Engineering Royal Institute of Technology. Hakansson, U., Hassler, L., Still, H., 2000. Rheological Properties of Cement-Based Grouts- Measuring Techniques: International Confrrence on Grouting in Rock and Concrete,Salzburg. Tolppanen, P., Syrjänen, P., 2003. Hard Rock Tunnel Grouting Practice in Finland, Sweden, and Norway - Literature Study: Julkaisija, www.mtry.org. Byle, M.J., 2001. Hydrofracture in Rock Grouting: Hydraulic Frac Workshop 2001, A workshop held in conjunction with the 38th U.S. Rock Mechanics Symposium, Schlumberger. www-old.dpr.csiro.au. Barton, N., 2002. Some new Q-value correlations to assist insite characterisation and tunnel design: International Journal of Rock Mechanics and Mining Science and Geomechanics Abstract, 39: 185-216. Janson, T., 1998. Controlling Grout Spreading in Tunnel Grouting -Analyses and Developments of the GIN-method. Tunnelling and Underground Space Technology, 15: 343-352. Garshol, K.F., 2003. Pre-Excavation Grouting in Tunneling: MBT (Switzerland) Ltd., www.degussa-ugc.com..
Twise, R., mooros., 2002. Geotechnical Engineering Hand book. Volume 2, JohnWilly & Sons. Yang, M.J., Yue, Z.Q., Lee, P.K.K., Su, B., Tham, L.G., 2002. Prediction of grout penetration in fractured rocks by numerical simulation: NRC Research Press Web site , http://cgj.nrc.ca. Amodei, B., wibowoj, 2003. Hard Rock Tunnel Grouting Practice in Finland, Sweden, and Norway - Literature Study: Julkaisija, www.mtry.org.